ASSISTANT PROFESSOR OF English Kimberly Segall will take 20 Seattle Pacific University students to South Africa this summer. There they’ll help disadvantaged youth, work with an AIDS education group and witness community theatre, all while exploring how a vocation in the arts can minister to people across cultures. 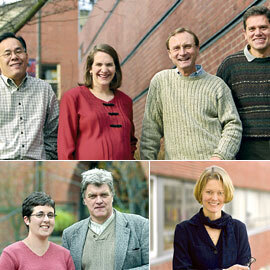 Segall’s project and two other facultyled initiatives received SPU’s 2002–2003 Faculty Grants for Theology and Vocation. To fund these programs, Seattle Pacific is using part of a $2 million grant from the Lilly Endowment Inc., which has launched a nationwide initiative to encourage college students to consider the theological meaning of vocation. In order to dispense funds from the Lilly grant, Seattle Pacific created an umbrella program called Spiritual and Educational Resources for Vocational Exploration (SERVE). SERVE is enhancing a variety of programs across campus, such as career services, internship opportunities and women’s studies. Bob Drovdahl, co-director of SERVE and professor of Christian ministry and education, hopes this concentration on vocation — literally calling — will help students search for something more than a job. “We want to help students focus on career and life choices with a clearer sense of purpose outside themselves,” he says. Also given a Faculty Grant for Theology and Vocation were Denise Daniels, associate professor of management; Randal Franz, associate professor of management; and Kenman Wong, professor of business ethics. They conducted a seminar last summer, training other faculty members in ways that a theology of vocation affects business practice. Tim Dearborn, dean of the chapel, facilitated the seminar. Rob Wall, professor of Christian scriptures, received a grant to produce a scholarly essay and lead workshops on women in ministry, dealing head-on with “problem Pauline texts” that discourage women from pursuing careers as pastors and teachers in the church. Shannon Smythe, who graduated in June 2002, assisted Wall in adapting his research for an informational brochure to use on campus.